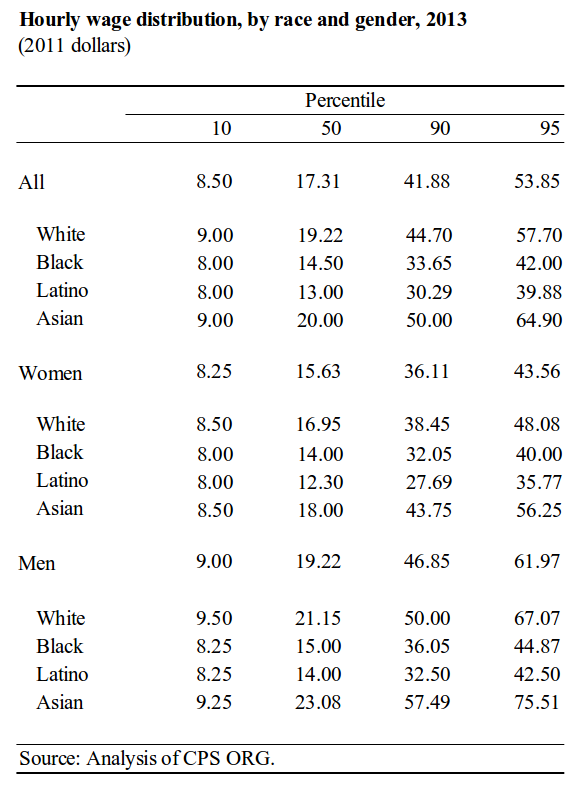 The table below summarizes the hourly wage distribution for all workers and for workers by gender and race, based on an analysis of the Center for Economic and Policy Research’s extract of the Current Population Survey’s Outgoing Rotation Group for 2013. One of the most striking features of the graph is that wage gaps both by gender (men versus women) and by race/ethnicity (white versus black, Latino, or Asian) are larger the higher up workers are in their respective wage distributions. For example, the ratio of the 10th percentile men’s wage ($9.00 per hour) to the 10th percentile women’s wage ($8.25 per hour) is 1.09. The ratio of men at the 90th ($46.85) to women at the 90th ($36.11), however, is much higher, at 1.30. A similar relationship holds by race. White workers at the 10th percentile of their wage distribution ($9.00), for example, make 1.13 times more then black workers at the 10th percentile of their wage distribution ($8.00). But, at the 90th percentile, the corresponding white-black wage ratio is 1.33. The basic pattern of bigger wage gaps at higher wage also holds for groups defined jointly by gender and race (white women versus Hispanic women, for example). Well, another long spell without a blog entry. I’ve just updated my publications page with some recent writing. I also wanted to post a link to a talk I gave as part of a panel on “What Policies for the Middle Class?” at a conference on “The Squeezed Middle Class in OECD and Emerging Countries–Myth and Reality,” at the OECD in Paris on December 1-2, 2016. My remarks start at minute 39:00. After a long break from posting, I’ve updated my publications page with the work I’ve done over the last two years. I’ll continue to take it easy over the summer, but I look forward to posting again after Labor Day. Second, low-wage workers are older and much better educated today than they were in the past. Today’s low-wage workers are much more likely to have a high school degree or even a college degree than they were four or five decades ago. They are also older and therefore likely to have more job experience. Since economists generally believe that older and better-educated workers should earn more than younger and less well-educated workers, again, the economy appears able to afford to pay workers at least as much as they did roughly five decades ago. 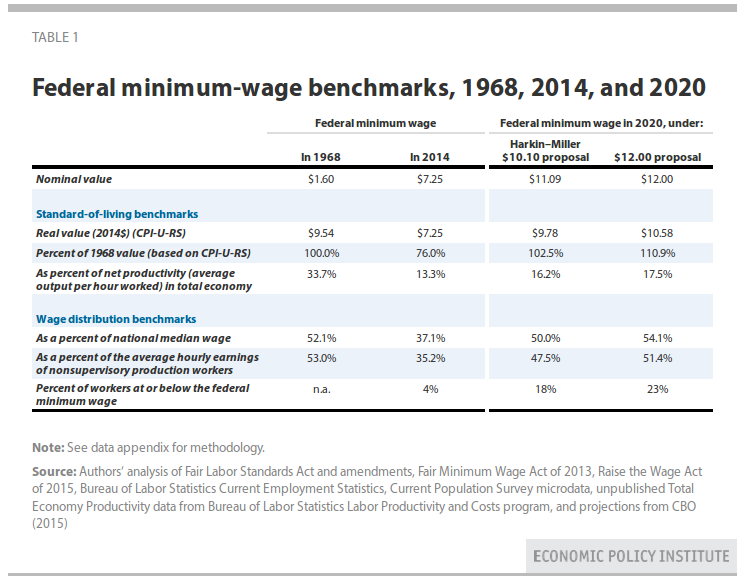 Two other key features of the bill that I want to point out, but leave for another day to discuss, are: the gradual elimination of the existing sub-minimum wage for tipped workers (currently just $2.13 per hour, where it has been since the early 1990s); and the setting of increases in the federal minimum wage after 2020 to match growth each year in the national median wage. 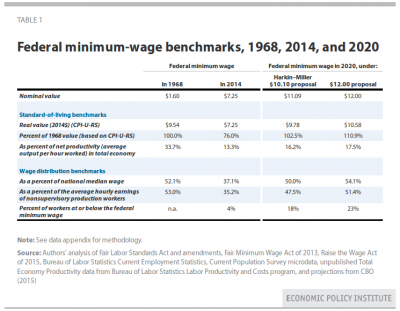 Both actions would tie low-wage workers’ prospects to the wage advances achieved by the rest of the workforce. 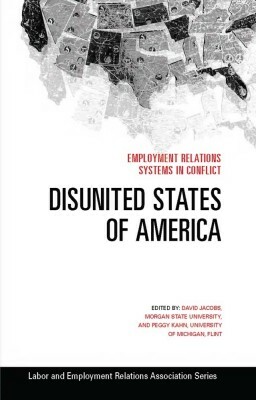 My chapter compiles and presents a lot of data on differences in minimum wages, unionization rates, earned income tax credits, unemployment insurance systems, employment protection legislation, and other dimensions of labor-market regulation at both the state and international levels. The main conclusion is that, while there is substantial variation across the U.S. states along many of these dimensions, these differences are small relative to the gap between the United States and the rest of the world’s rich economies. 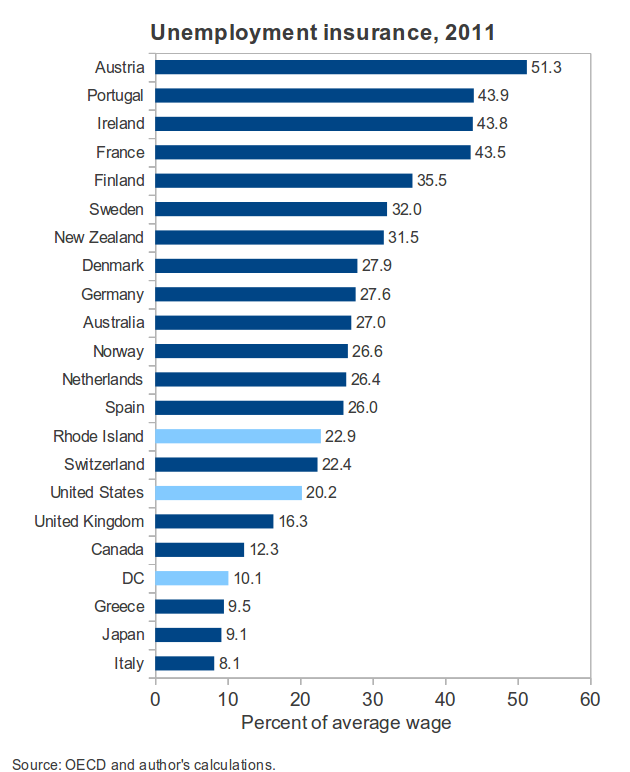 To give just one example, the figure below shows an OECD-calculated measure of the generosity of unemployment insurance benefits in the core OECD economies, together with my own roughly comparable estimates for the U.S. state with the most generous unemployment insurance system (Rhode Island) and the least generous system (District of Columbia). By the OECD’s calculation, the United States as a whole has one of the least generous unemployment benefit systems. But, the figure illustrates that even the most extravagant U.S. state program would still look miserly by international standards. A similar pattern holds for the other indicators I examine: even the most “inclusive” U.S. labor-market systems compare poorly to our peer economies. 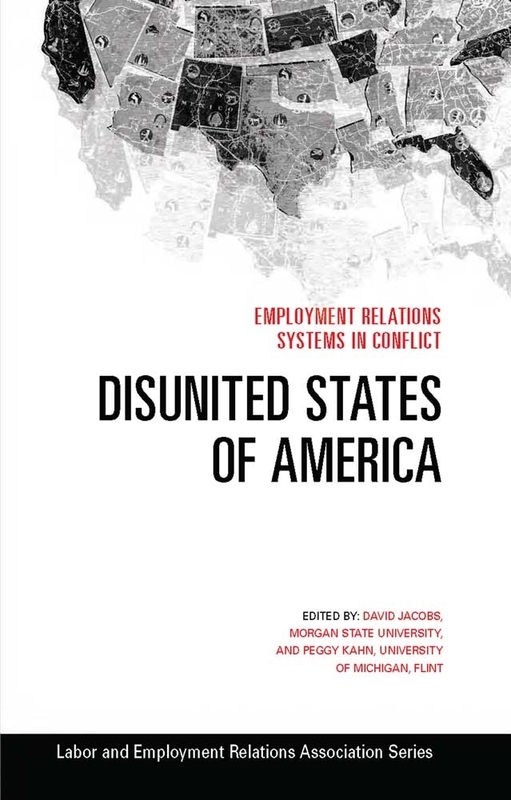 The other chapters in the volume include: “The persistent effects of slavery in the United States: culture, legal policy, and the decline of American labor unions,” by Raymond L. Hogler; “Labor in the world of cynical conservative federalism,” by Nathan Newman; “Worker centers as an inflection point? An introduction and an interview with Kimi Lee,” by Peggy Kahn and Kimi Lee; “Beyond the Family and Medical Leave Act: the pluralization of leave rights from below,” by Peggy Kahn; “Labor and class in a neo-mercantile context: a view from the U.S. Midwest,” by Roland Zullo; “Health insurance coverage of low-income workers in the United States,” by Sara R. Collins and Tracy Garber; with a conclusion on “Reconstituting laborist capitalism,” by David Jacobs. In a new CEPR report out today, I argue that the US labor market is failing on two fronts. 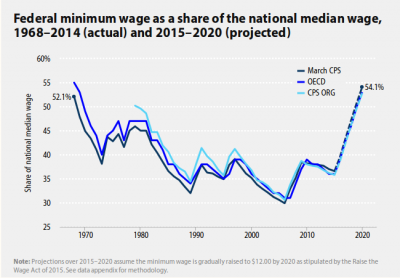 The first failure is the decades-long stagnation of real wages at the middle and the bottom of the wage scale –even as earnings at the top have grown rapidly. The second failure, only apparent since the early 2000s, is the sharp deterioration in job creation. In the standard view, high and rising wage inequality was supposed to have been the secret ingredient that allowed the US economy to create jobs more rapidly than other more “rigid” economies. I’ve never been convinced by that particular argument, but at least before about 2000 there was a case that the US economy was doing a decent job creating jobs, whatever the specific cause. 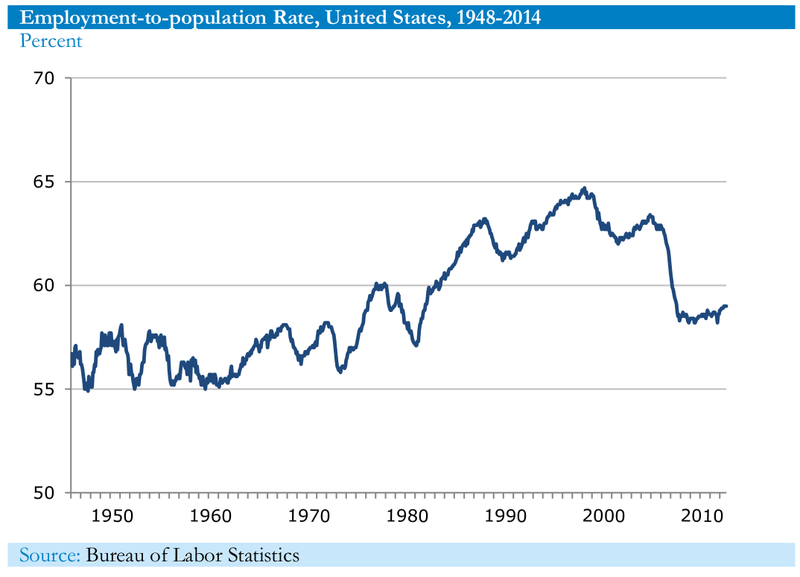 But, as this new report demonstrates, since the early 2000s, the US employment performance has been pretty dismal. If inequality was ever driving job creation, it hasn’t been doing so for more than a decade. The Bureau of Labor Statistics released its estimates of union membership and union coverage for 2014 this morning. 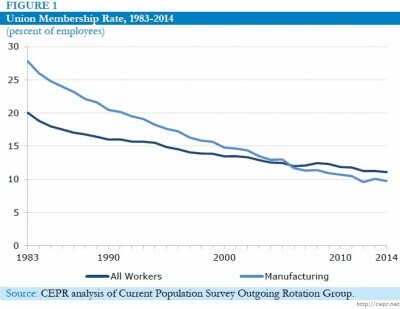 Last year, the share of U.S. workers who were members of a union fell 0.2 percentage points to 11.1 percent, continuing a decades-long decline in unionization in the United States. My CEPR colleague, Cherrie Bucknor, and I (with the help of Nick Buffie) have written a quick analysis that attempts to put these latest developments into longer-term context. You can read the full story here, but two points are worth highlighting. 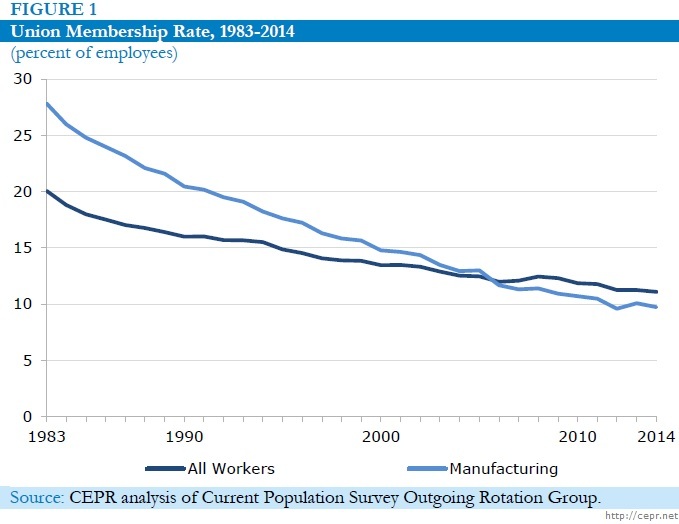 First, since the mid-2000s, workers in manufacturing are actually less likely to be in a union than the average worker is. 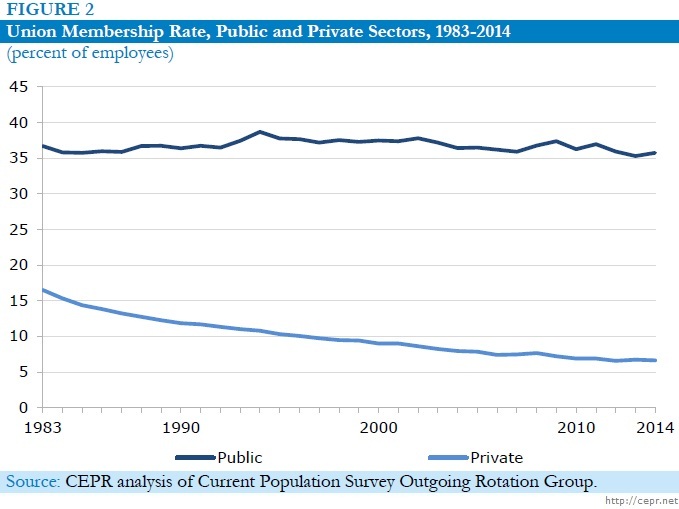 Second, the union membership rate in the public sector –where employer opposition tends to be much lower than in the private sector– is relatively high and has changed little over the last thirty years. 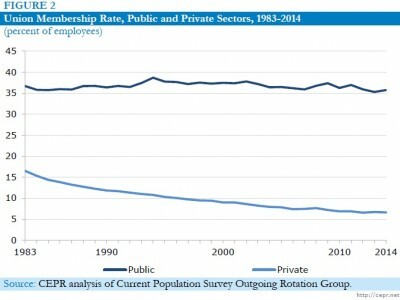 By contrast, in the private sector, where labor law and strong employer opposition make it difficult for workers to join unions, membership has been much lower and falling steadily . UPDATE 01/24/15: The Wall Street Journal‘s Melanie Trottman cited our research in her coverage in today’s print edition (behind a paywall). On New Year’s Day, the cap on the Social Security payroll tax increased to $118,500 per year (up from $117,000 in 2014). Workers pay Social Security tax until their annual earnings reach the cap and then pay no additional Social Security tax after that (until the following year, when the clock restarts). One way to increase revenues available to Social Security would be to raise or eliminate the cap. In a report out today, my CEPR colleagues, Nicole Woo, Cherrie Bucknor, and I use data from the American Community Survey (ACS) to estimate how many workers would be affected if we raised the cap to $250,000, $400,000, or just eliminated the cap altogether. According to our analysis of the ACS data, about 6.1 percent of all workers have earnings from work in excess of the new cap; about 1.5 percent earn more than $250,000 per year; and about 0.7 percent are above $400,000. The report includes tables with breakdowns by race, gender, age, and state. 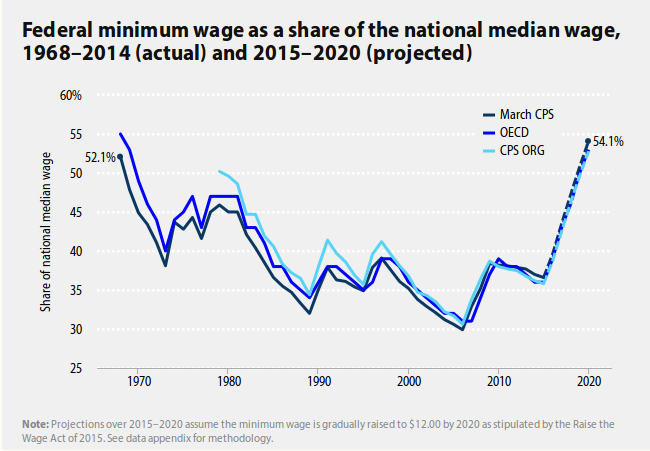 The Inter Press Service news agency has published an interview with me by journalist Peter Costantini focusing on the minimum wage. There’s a longer version here and a shorter version in English here and in Spanish here. On Christmas Day, the New York Times ran a great story on the “tougher road to employment” for black recent college graduates. The piece featured research by my colleague Janelle Jones and me, which originally appeared as a CEPR report (pdf) back in May. In fact, the unemployment rate in 2013 was lower among whites who never finished high school (9.7 percent) than it was for blacks with some college education (10.5 percent). Black graduates are suffering from a version of last hired, first fired, Mr. Darity said. The effects of discrimination are blunted when the work force is expanding, but in harder times minorities are much more vulnerable, he said.